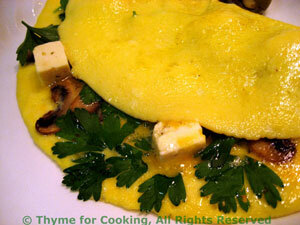 Parsley, Mushroom and Feta Omelet, Thyme for Cooking easy first course. Lots of late parsley and a bit of cubed or crumbled feta add sharp flavors to this simple omelet. This is a small omelet, for a first course. Remove parsley leaves from stem, leave whole. Divide into 2 piles and set aside. Clean mushrooms (using brush - do NOT wash) and slice thickly. Heat 2 tsp oil in medium nonstick skillet. Add mushrooms and sauté until golden brown, about 10 minutes. Remove from pan and divide in 2. In a medium bowl beat eggs well with a wire whisk. Heat an 8 inch nonstick skillet or omelet pan over medium-high heat. Add 1 tsp oil and half of the eggs, swirling to cover bottom of pan. When the eggs are almost set lay half of the parsley leaves on half of the omelet. Top with half of the mushrooms and half of the feta. With a spatula turn other half of omelet on top.